To get people sharing, grow your fans, make money, or know who’s reading your content, let us help you. 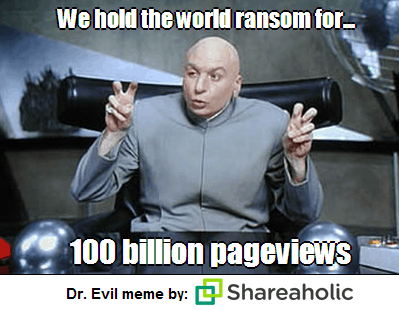 Add Shareaholic for your site today! Ever wonder how an article, blog post or news story can become so popular? The Internet and social media have made it easier than ever to create AND distribute content that folks with access to a reliable connection will gobble up instantaneously and share even before they’re done consuming it. But what types of content are actually shareworthy? Here, we highlight 3 types of shareable content. Lists are still in (and probably will be for a long time). Why do they work? Lists are easy for readers. There’s so much content out there that most readers don’t always have time to read prose. Some are simply interested in the highlights — and that’s what lists promise. Within seconds, a reader can scroll through a list to consume the main points and if the list was good, they’ll share it, knowing their friends won’t have to spend hours pouring through words that may not have been worth reading. Who’s awesome at creating shareworthy listicles? BuzzFeed and Business Insider are. BuzzFeed’s amazing image- and gif-heavy listicles make it the golden child of the digital publishing era with posts that you just HAVE to share because you know it’ll brighten up your friend’s day as much as it did yours. BusinessInsider’s addictive slideshows make it easy to click through to discover each of the 10 Best Careers for Recent College Graduates and then onto the next recommended post, but not before sharing with your friends who would probably high-five you for introducing them to the story too. Numbers tell an incredibly compelling story, especially if you have a representative data set. Why do they work? People trust data, and businesses love it too, just not when the government is snooping around. Data reports usually reveal interesting patterns and trends that may confirm or contradict people’s assumptions — a bit of certainty goes a long way. Data also leads to insights, which can generate discussion, and thus the sharing begins! Who’s creating shareable data reports? We are. Earlier this week, we released a new report that showed sharp trends in social media traffic referrals to online publishers. So far we’ve received more than 110 shares for our post. Mashable even covered the story (their post-about-our-post received more than 7k shares in less than 36 hours). It’s a funny thing. People usually listen to credentialed experts. How and why do these types of posts work? First, in order to craft a shareworthy expert round-up post, you need to reach out to thought leaders in your space (preferably ones with a large social media following). If you’re a food blogger, connect with other prominent foodies. If you’re a fitness guru, you can go home happy if Tim Ferriss answers your email. If you’re into startups, turn to other entrepreneurs (just don’t embarrass yourself by trying to tweet Mark Zuckerberg). Ask a handful of them a question, collect their responses, write up your post, and don’t forget to ping your kind and generous contributors when it’s published. They’ll share it with their social media fans, simply because you wrote about them. Who’s successfully rounding up experts for stories? The Young Entrepreneur Council is. The organization does a monthly Q&A with its membership of nearly 1,000 entrepreneurs and founders — I’m a member! — requesting short and actionable tips other professionals should know in order to run their businesses better. Here’s one example of a post Dave Kerpen, Founder of Likeable Local, published for the YEC on his LinkedIn Influencers column: 17 Things You Should Never Say to Your Boss. Does #6 look a bit familiar? Oh, and did you notice the story was viewed more than 750,000 times?! Is that shareable enough for you? What are your most-shared pieces of content?